The following information offers an introduction to the BBC Domesday project. For information about the Domesday86 project (on which this site is based) please click on this link. After the Norman invasion of England in 1066 William of Normandy commissioned ‘The Great Survey’ to be produced in 1085 and by August 1086 the first draft was complete and contained records for 13,418 settlements across England from the far south to the borders of Scotland. The survey was to assess the taxes owed to the crown during the reign of King Edward the Confessor and allow William to reassert the rights of the crown. Due to the assessments in the survey being regarded as ‘indisputable’ the book became known by the English as the “Book of Judgement” and its completion the “Day of Judgement” or Domesday in old English. The name Domesday was eventually adopted by the custodians of the book and was first found in official record in 1221. 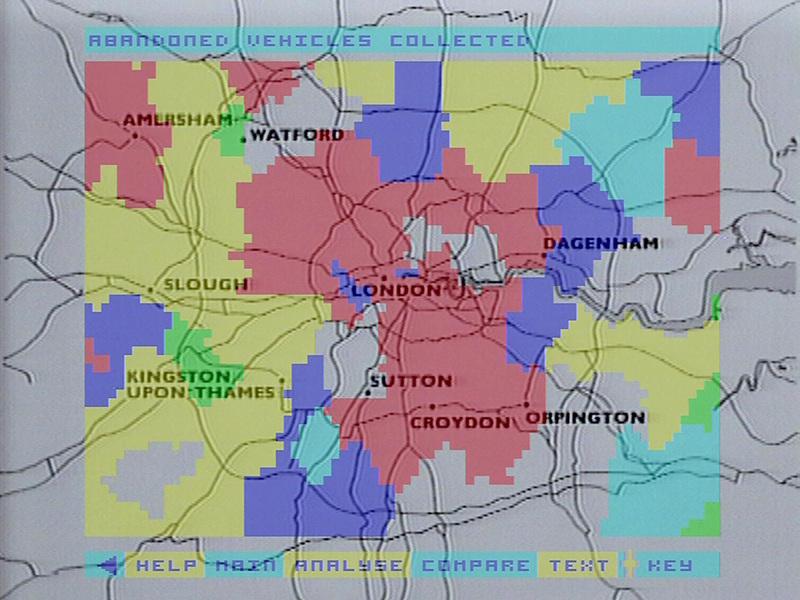 In 1983 Peter Armstrong (a BBC Television producer at the time) considered the possibility of a modern version of Domesday, initially as an interactive documentary. An idea which grew to include video, images, maps, statistical data, etc. This formed the basis of the 1986 BBC Domesday project. The modern Domesday was compiled between 1984 and 1986 and published in 1986 with over a million people participating in the project. People (especially school children) supplied articles about local geography, social issues and daily life across the UK. This was linked with maps, photographs and statistical data to form the basis of the modern Domesday. 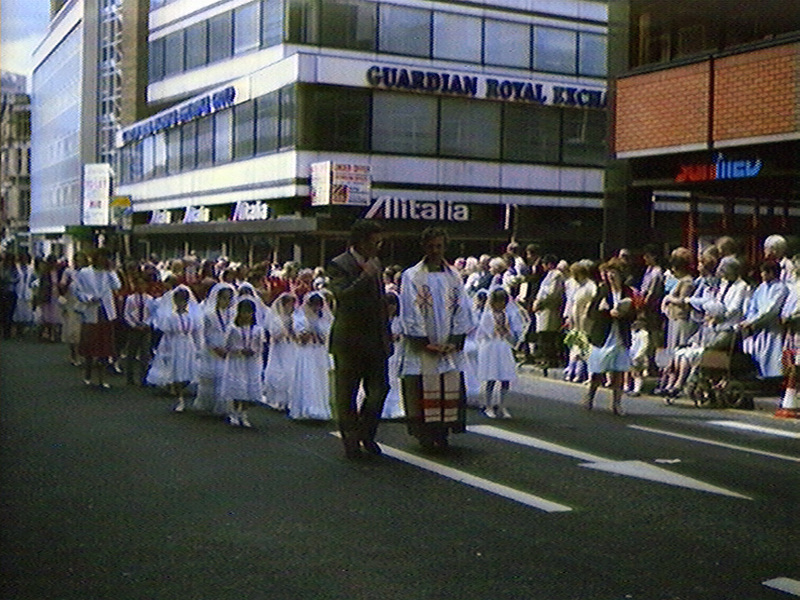 In addition, professionally made material was also included such as virtual walks, OS maps, colour photographs and the 1981 census data. The project was a partnership between the BBC, Acorn Computers, Philips and Logica with additional funding from the European Commission’s ESPRIT initiative and was envisioned to mark the 900th anniversary of the original book’s completion. The Domesday hardware consisted of a BBC Master computer fitted with a second-processor to enhance both the processing speed and the memory of the computer. In addition, a specially developed AIV (Acorn Interactive Video) SCSI card was fitted to interface the computer with the Philips VP415 LaserVision player. The Philips VP415 LaserVision player was a LaserDisc player developed specifically for use with Domesday. It provided a wealth of video and audio functionality (including video clock matching and video mixing) as well as providing a SCSI-1 interface for retrieval of the data portions of the disc. To control the Domesday user interface a Marconi RB2 trackball was included; this provided a 3-button mouse-like interface however, only 2 of the available buttons were used by the software. 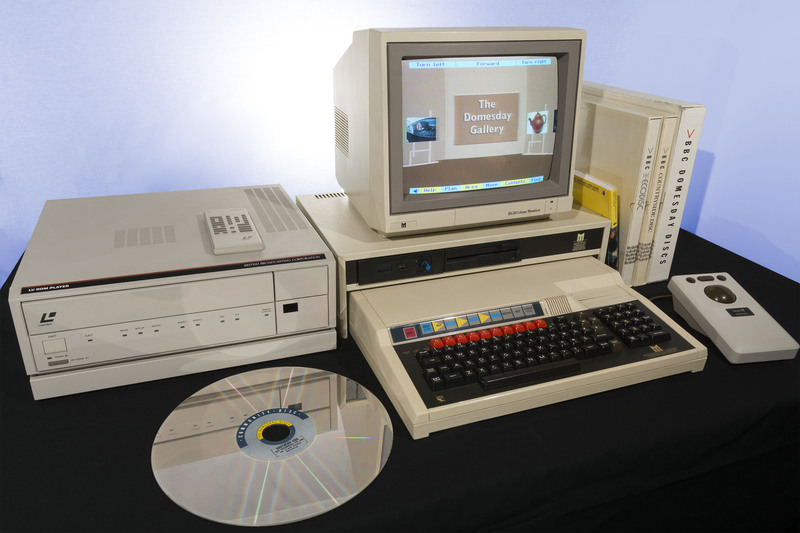 After the initial release of the Acorn-based Domesday system another version was created for the Research Machines Nimbus computer, however this system did not gain much popularity. The Acorn Master computer was fitted with a VFS ROM (Video Filing System) which was similar to the existing Acorn ADFS filing-system. VFS was read-only, but included a number of extensions to support ‘F-Codes’ (the language used by the VP415 to control the LaserVision features). The main application for Domesday was written in a language called BCPL (Basic Combined Programming Language – a precursor to the ‘C’ programming language). The mainstay of the application development was performed by Logica (in a team led by Jardine Barrington-Cook), although there was a lot of interaction between Logica and Acorn during the development period. BCPL was designed to run in a ‘virtual machine’ to provide cross-platform compatibility making Domesday one of the first major projects to take advantage of such architecture. Even with the expanded BBC Master computer, almost every available byte of RAM and processing power was used to make the Domesday application function as intended by the BBC. The project was divided into two LaserDiscs, the Community Disc and the National Disc. Both discs contain a mixture of both still images, video, audio and data. The discs comprise of 108,000 still images and 648 megabytes of data (per disc). 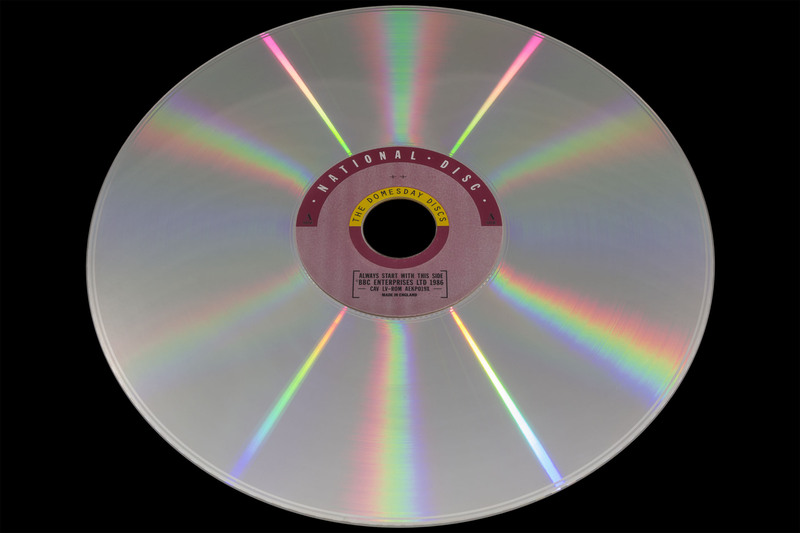 The LaserDiscs are specially adapted for the Domesday project using a format called LaserVision Read Only Memory or LV-ROM for short. Data and images for both discs were collected and organised by the BBC Domesday project based in Bilton House in West Ealing where the premastering of data was carried out using a VAX 11/750 mini-computer along with a network of BBC Micro Computers. The discs were mastered and produced by the Philips LaserVision factory in Blackburn, England. 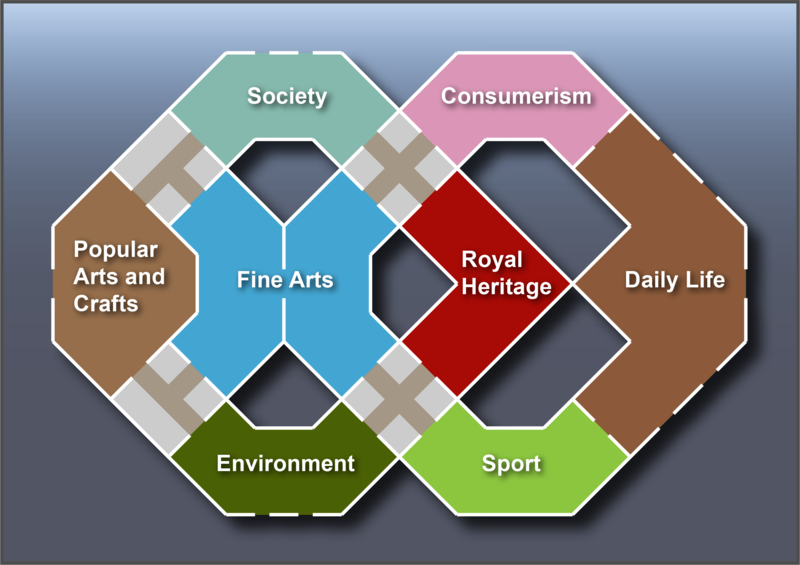 The Community Disc represents the “people’s view” of the UK. The UK landmass was divided into “D-Blocks”; each block was a 4Km by 3Km square based on the Ordinance Survey grid references. Each D-Block was allocated space for up to 3 photographs and 20 text articles. Not all D-Blocks contain the maximum amount of information (some, in more sparsely populated areas contain almost no information at all). The photos and documents are linked by several levels of maps providing several ‘levels’ of zoom above and below the D-Blocks. Maps at the sub-D-Block level are limited to areas of particular interest. In addition, satellite imagery and aerial photographs are included at the levels above the D-Blocks for many areas. 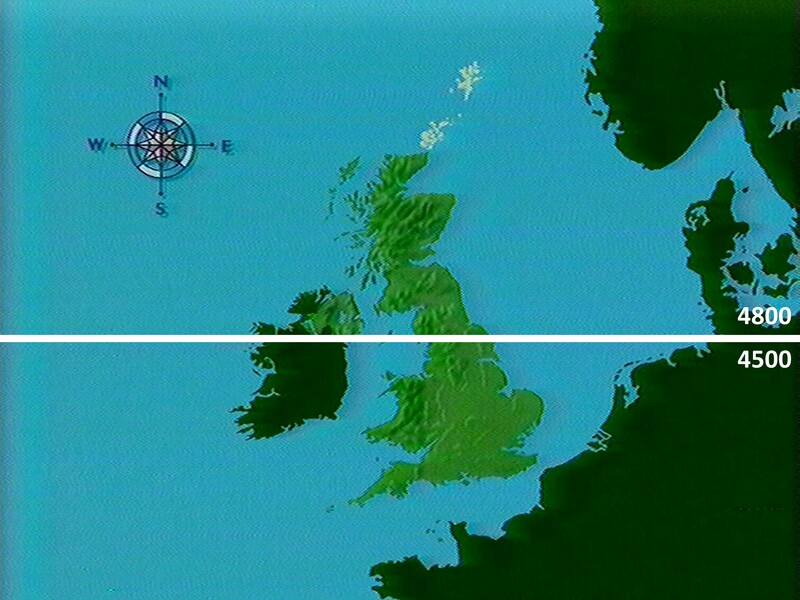 The two sides of the Community disc are divided into the north and south of the UK (the dividing line was called ‘the Domesday Wall’) although country-wide data at the 40x30Km level was provided on both sides of the disc. Most of the D-Blocks were assigned to local schools (around 9,000 schools were involved in the project) within the block and the articles and pictures were submitted by school pupils (although there are exceptions and many teachers and local community members also submitted items). For an example of the typical D-Block content please see the example content for central Manchester. The National Disc contains a much wider variety of material including virtual walks, the 1981 census data and many sets of professional photographs compiled into indexed sets. Rather than being map-based, the information is stored in a hierarchical structure. The disc also provides a virtual 3D gallery around which the user can ‘walk’. The gallery is divided into multiple sections, each containing the various picture sets associated with the section. The National Disc also provided a natural language search facility (one of the first of its kind) allowing users to simply enter their search terms and have the results presented to them automatically. Although the majority of the information on the National Disc is hierarchically organised, the interface allows the user to overlay statistical data onto maps using a system known as ‘areal units’. The user can specify a region and the required dataset and the Domesday software presents a map with the data overlaid pictorially. A comprehensive set of graphing tools is also provided for visualising data. The National Disc also provides a number of “Surrogate Walks” which are virtual 3D tours of various environments including housing, towns, etc. 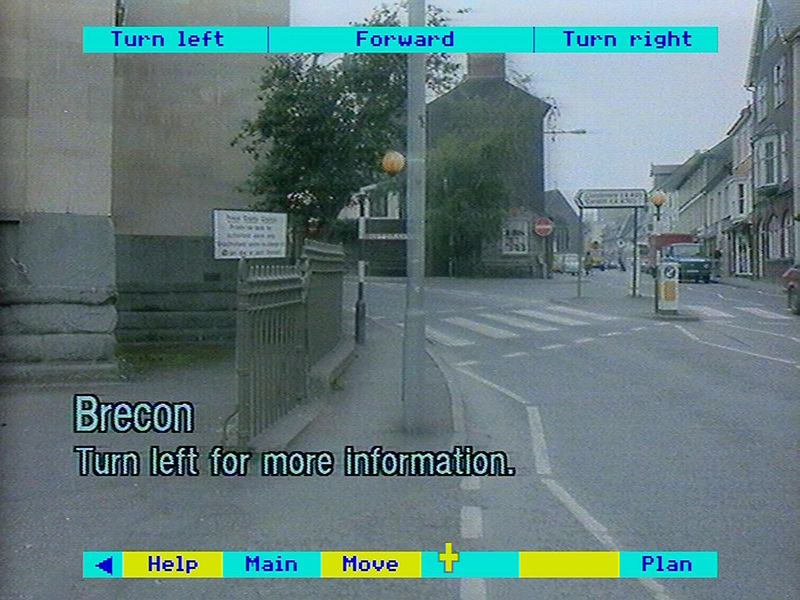 One side of the National Disc contains the features described above, the other side contains 60 minutes of news footage split into years spanning 1980 to 1986 (the side is called ‘Images of the 80s’). The Images of the 80s is the only part of the Domesday disc set which is not interactive. The discs were published by BBC Enterprises in November 1986 and were available as a complete package including the required hardware. The price of the system on release was around 4,000 pounds which was over twice the cost projected when the project was initiated. This made the system too expensive for most schools and the British government decided to subsidise the system in order for schools to be able to use it. The audience for the Domesday system was primarily schools, libraries and universities although there was some marketing towards businesses due to the inclusion of maps and geographical census data. The release of the system was generally considered a success, however it fell very short of the sales targets projected for the system. The BBC also released the Domesday Display package containing software that allowed users to use the original Domesday discs to make their own presentations containing media and data from the original disc set. The Domesday system was also released for the RM Nimbus range of computers although very few were sold. The Eco Disc was also ported by Apple for use with the Macintosh Hypercard system. This was released on CD-ROM and contained footage and sound produced for the AIV LaserDisc version. Apple went on to produce their own LaserDisc based interactive system for schools called the Apple Visual Almanac (in 1989). Virgin Publishing also produced their own LaserDisc for the AIV system called ‘North Polar Expedition‘ (however, this contained software on floppy disc and was not a LV-ROM format disc). Another interactive video project called “Interactive Video In Schools” (or IVIS) was also released based on INSTAVIEW from a company called ‘The Soft Option‘. This system could use the original Domesday system, however there were options to use LaserDisc players other than the VP415.